Located in the Great Wall at Jiayuguan Pass, Great Wall Museum was completed in May, 2003. The main building is in the shape of a beacon tower connected with the Great Wall. The museum includes 7 exhibition halls where you will know the construction history of the Great Wall from the Warring State Period (770 BC – 221 BC) through the Qin Dynasty (221 BC – 207 BC) to the Ming Dynasty (1368 - 1644). At the Great Wall Museum, you will get acquainted with the construction history of the Great Wall through models, texts, and pictures. The large-scale oil painting "the Great Wall" puts the main landscapes of the eastern section of the Great Wall of China, the central section of the Great Wall of China and the western section of the Great Wall of China into one picture through a combination of freehand brush work and the means of realistic description. It strives to show the magnificence, spectacular scenery and profound cultural connotation of the Great Wall. The area of the oil painting is 220.5 square meters. Super-realistic sculpture--"Xichu Yangguan, Chunfeng Yumen", with the background of the Great Wall at Yangguan Pass and Yumenguan Pass, vividly reproduce the situations of the Chinese and Western culture on the Silk Road during the Tang Dynasty (618 - 907). The background oil painting "Zuiwo Shachang" depicts the magnificent scenery of the desert and the sunset, and the sculptures presents that the soldiers fought against the invaders for the motherland in the ancient times. In addition, you can explore the ancient weapons, the cultural relics discovered at Jiayuguan Pass, the paintings and calligraphy by celebrities. 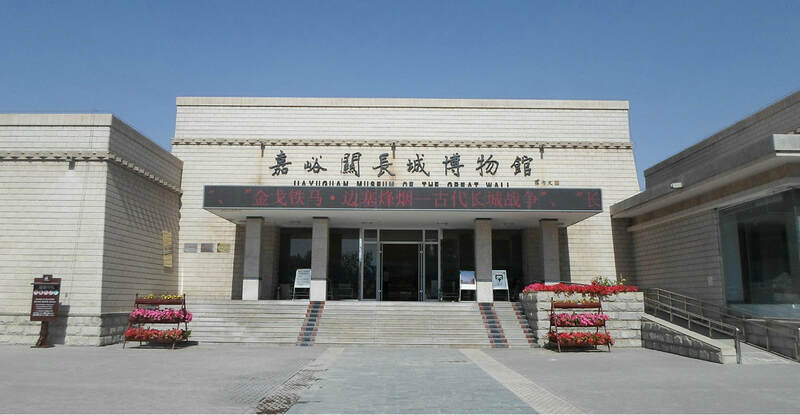 As the Great Wall Museum is situated close to the Great Wall at Jiayuguan Pass, you could visit the museum before exploring the Great Wall. Please present your passport at the ticket office to get the free ticket. Interested in visiting the Great Wall Museum on a Tour? Wendy Wei Tours offers a variety of different packaged tours as well as custom tours including the Great Wall Museum, among other attractions and destinations. To find out more, please visit our Tours page or Contact Us directly to find out more.